The following is a free translation of an interview originally published in El Universal newspaper and re-posted in www.laclase.info (“Chávez convirtió a dirigentes sindicales en sus jarrones chinos”). Chirino is like a small automobile that has a strong carburetor. Clearly, the mileage is long and the road travelled has been tortuous after having spent 40 years involved in both the labor struggle and politics. In Venezuela, Trotskyites do not proliferate and even though he did not veer off from” the permanent revolution” Orlando Chirino was part of the chavismo movement (as a fellow traveller) in struggles that involved the UNT, a trade union with a horizontal structure and collective leadership from which he left “when Chavez showed his true colors”[cuando Chávez sacó las uñas]. 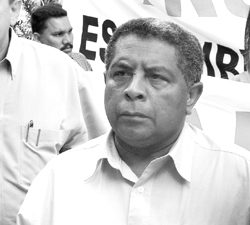 In the 1970s, Chirino was a militant of MIR [ Left Revolutionary Movement] ; founder of unions in the textile industry and these days, founder of a new political party while he is part of the Frente Autónomo Para la Defensa del Empleo y los Sindicatos (FADES)[Autonomous Front for the Defense of Jobs and Unions] Chirino dreams of the creation of a national trade union comprised of workers from all tendencies that can go beyond the economic fight. Did you stop believing in the Chavez because you changed your mind or because you think that Chávez betrayed the Marxist revolutionary ideals? I still uphold the same ideals. I believe in socialism, workers’ democracy and total freedom, a freedom that goes beyond of what we have won from imperialism and the bourgeoisie. I believe in a society where respect for dissent, the right to debate and respect for majority vote is one of the central tenets. Chavez has never been a socialist, but instead, he was a military man who led a coup and who had the virtue of turning a political defeat into an extraordinary political victory. Our involvement in the process was a result of the political proposal that came after that. So why participate in the Bolivarian process? I was never a chavista and I was deceived back then. A major segment of the population saw in Chavez a great hope. During 2002 events I took part in the defense of the popular will expressed in 1998. We participated in 2004 when the referendum ended up being a sham prostituted by Chavez. Then I ask myself, who will participate now if the Chavez government ended up persecuting those who signed? Ever since then, the leader of “Cuban socialism” has been poking out his head in the Venezuelan process. This is the “Cuban socialism” which we consider to be a Stalinist bourgeois regime because there is no planned economy and capitalist expropriations were decided by the top leadership; and where labor organizations lack autonomy. Did you always have that critical position about the Cuban regime? Yes, of course. One of the huge events of humankind was the Soviet revolution. Lenin died in January 1924 and the whole process of bureaucratization and degeneration of the Soviet state later appears in the thesis espoused by Leon Trotsky. Thus, I became a Trotskyist because I thought it was necessary to democratize those regimes. A bureaucratic caste in Cuba kidnapped the possibility of true socialism. Even though we sided with the Cuban people against the blockade, this process was an expression, like the process in Venezuela now with some differences, of the kidnapping of true socialism in Cuba by a bureaucratic caste. For 14 years now, Cuba has been moving toward the restoration of capitalism. During this process, the people have even lost the ration food card. Was it naive to think that Chavez would impose a Trotskyist, revolutionary program? We fought an internal battle. However, we broke with Chavez in 2006 when he showed his true colors. From then on, we would vote for him critically. But our differences became insurmountable the moment he sought to impose a single party as the representative of the process. Afterwards, he states that “the autonomy of the labor union autonomy is a poison from the Fourth Republic [prior to the Caracazo]” and that he would not be blackmailed by certain union leaders. Another reason why we broke with Chavez was the the constitutional reform bill which I denounced as being backwards. You can criticize Chavez but you cannot deny that he has nationalized companies to put them under worker’s control. That is a total fallacy. Are workers running those companies that have been nationalized by the state? Most are not nationalized because what they are business deals where the government buys private companies. A few of them have been paid very well while others have not. At those companies, on the other hand, there is no workers’ control; what does exist is in fact a system where the bosses control the workers by like our compañero Rubén González says. For expropriations to happen, the stability of workers, respect for their organizations and their collective agreements must be part of the deal. But above all, it is the workers who must decide whether or not to have Workers Councils. Deep down, however, what is the reason for our fight against capital? Surplus labor. You, the owner of the factory and land, I put me to work and pay me a miserable salary and then keep the big profits. In the case of the Venezuelan State, Fidel Castro advised Chavez to not even think about implementing co-management (cogestión). Do nationalized enterprises generate profits? That’s what they said in the former Soviet Union and then you saw people drinking vodka non-stop while the surplus benefited the bureaucracy. Until it was discovered how it was. In Venezuela this bourgeois and Stalinist regime is building a new middle class; much more parasitic than the old one because it produces nothing and has destroyed everything. This class embraces an export economy and that is where corruption appears. What we want is jobs because a country is built by producing. Is the worst state that private employer? Yes, but since this country is polarized and everything is manipulated by the media and the government, if I told that one is worse than the other the next day the chavistas would accuse me of defending the private sector . But I have no doubt that this government has violated workers’ rights. For example, [unionist] Rubén González was put in prison for leading a strike in protest against the violation of collective bargaining. And that was with the assistance of the Prosecution and the Judiciary. Here in this country you never saw the judicial system going after trade union leaders protesting. In addition, the sicariato [hit men] emerged and it has already murdered 8 fellow members of the Unitary Revolutionary Autonomous Class Current. Was the Fourth Republic more democratic? We do not want either one [Chavismo or the Fourth Republic]. We believe that it was time for workers to become the backbone of change. And when I say workers, I mean people like you, journalists, doctors and so on. How can workers become the vanguard in a country where over 60% of the population lacks formal employment? Of the economically active population, 13 million people, 6 million are in the informal economy and there is one million 200 thousand who are unemployed. But in a government where we were to play a key role I assure you that economy would be revived by lowering import rates from 77% to 10% and generate employment. Previous governments used the trade union movement and did not respect their autonomy thus, the [old trade union] CTV became one of the legs of the bourgeois democratic regime. But Chavez has been worse because he turned union leaders into statues [jarrones chinos]. For example, when he announced the new salaries all the union leaders were sat behind him but he never met with them although he does so with the leadership of the CNT [trade union] in Uruguay. He even welcomed the employers but not the workers because this is a military government. Do you think the “new man” that embodies the process is Diosdado Cabello, Cilia Flores, Reyes Reyes? We do not lose the hope of building a separate and independent trade union which is profoundly democratic. Is that possible with under a government by Chavez? No, it is not which is why we must defeat it. What is your political choice being that there are two poles? I do not think this is the case. The country is polarized, but I ran for Parliament on the ticket of PPT [Fatherland for all] and always considered the need to build another alternative on the fundamental platform of workers. If you ask me today if I will be with the Mesa de la Unidad [right wing platform] or Chavez, I tell you that we do not want to polarize issues around an electoral campaigns when the President campaigning with a brutal neo-liberal offensive that is dismantling working class gains. He wants to destroy our efforts to revive the concept of the union as an organization of all workers who can forge a powerful union. That is on the labor front. In the political front we are touring the country and collecting signatures to create a workers’ party. And CNE [electoral body] prevents us from calling it a workers’ party, we call it Left Socialist Unity. If we do not build the party we fall trap to political polarization. But it will be a long time before the party is constituted. Chirino said that FADES [the new united labor front] is calling for the May Day march which will gather on the Centro Lido. “We have governors, mayors and ministries that steal the money from the Venezuelan people to proselytize, buy activists and pressure people. We will demand a general increase in wages and salaries, a reactivation of the collective bargaining agreements, an end to the criminalization of protest, freedom for trade unionists brought to justice, lifting legal schemes against more than 200 union leaders and for autonomy and freedom of association to be respected. You can tell me that I was there [as part of the early grassroots chavista movement]. The truth is, back then I dreamed that if you created a strong internal current we could rescue the reasons why the people voted for Chavez. Our movement C-CURA(Unitary Revolutionary Autonomous Class Current ) was divided because on this and some colleagues who worked with me for 40 years lost the unions and these days they are fragile, inanimate objects under Chavez’s control. No respectable leader cannot approve that Bs.6 salary increase, a daily misery that is not even enough to by a cup of coffee. What feelings do those old comrades provoke in you? It makes me sad to know where they’re at. But they also provoke outrage because there is no democratic opening so the workers, not me, can take the leadership in the movement. One example is that of the Metro workers. They signed a collective agreement in the presence of the general attorney and Chavez abolished it while Francisco Torres (pro-government leader) persecuted the workers. Afterwards, elections were held; the workers voted against the pro-government leaders but with the aid of the PN [police] they stole the ballot boxes and were declared the winners. Personally, I have nothing against these union leaders but I hope that one day there will be an independent legal system that can prosecute them and put them on trial. Even Juan Jose Delpino (from old bourgeois parties like AD and president of the CTV) would call strikes in the past. Today, these pro-government union leaders do not even dare to strike.